Unless you’re a dyed in the wool anti-government type, a wealthy financial services hustler or a politician you probably know that privatization is a scam. Ask anyone in a state that outsourced corrections to Corrections Corporation of America or the GEO Group how that’s working out for them if you’re not convinced. Scores of studies have shown clearly that not only does outsourcing a service make it less likely it will be done properly, it doesn’t any save money. A big part of that is that us taxpayers wind up getting double-billed. First we pay for the contract to CCA or some other multinational corporation answerable to shareholders not taxpayers. Then we pay again to get the job done properly after the private sector does a half-assed job. 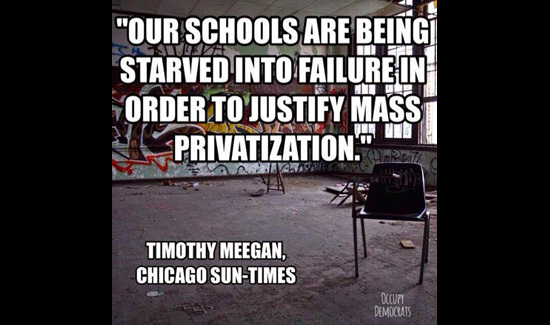 In Chicago, Rahm Emanuel is something of a poster boy for privatization schemes. But Rahm’s no dummy. So he started small by privatizing janitorial services in Chicago. They must have saved a bundle right? Not so much. About half of the principals in the district responded to a survey by the Chicago Principals and Administrators Association and said that ever since the school district awarded $340 million in two custodial management contracts in February to private concerns, their schools have been downright filthy. How bad is it now that the private sector solution is in place? Among the more serious problems reported include infestation of with rodents, roaches and other bugs. The floors are covered in muck. The garbage bins aren’t getting emptied and overflowing. The toilets look as if they haven’t been cleaned in years. If you have the guts to use one you should bring your own toilet paper and soap. It’s so bad that the principals have reported that they’re spending a lot of their workday cleaning just to be able to stomach their own work environment. That’s exactly what they said about private prisons before the lawsuits started rolling in. So the results are in. 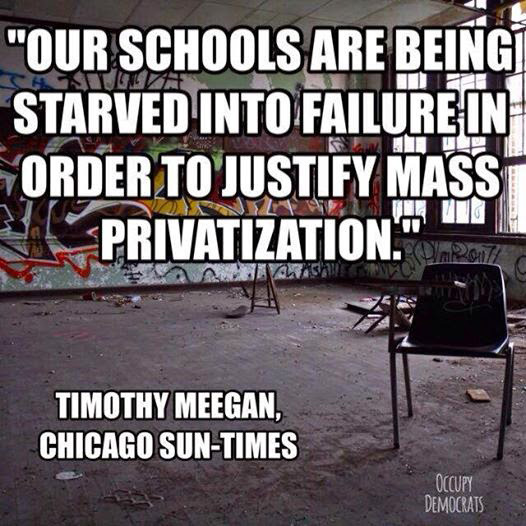 Privatization is a scam. But like all good scams it doesn’t look like it’s going anywhere soon. There’s just too much money in it for a select few. That’s why we’ve seen the privatization of huge swaths of the US military, border security and education sectors with no signs of any let up. Despite the fact that the hustle is as plain as day. Who’s to say we couldn’t balance the budget by outsourcing policing in the US entirely?